An newspeak eo yezh Oceania, er romant saoznek Nineteen Eighty-Four, gant George Orwell e 1949. Honnezh zo ur yezh hag a zo ur benveg krouet gant ar stad hollveliourez en sell da lakaat harz d'ar frankiz da soñjal, ha d'ar meizadoù a c'hallfe mont a-enep ar galloud, evel ar frankiz, ar peoc'h. 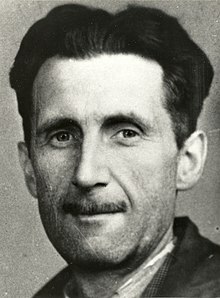 Kement doare-soñjal disheñvel a zo lakaet da dorfed (thoughtcrime) pa'z int kontrol da ideologiezh an Ingsoc, pe Sokialouriezh Saoz ; ur benveg eo an Newspeak etre daouarn Big Brother hag ar Strollad, a zo e penn ar vro. Displeget eo petra eo an Newspeak er rann “The Principles of Newspeak”, ur goudeskrid d'ar romant Nineteen Eighty-Four. En un doare yezhel e tenn an Newspeak d'ar saozneg e-keñver yezhadur, nemet koazhañ dizehan a ra niver ar gerioù da leuskel o lec'h da c'herioù eeunik. Ar pal, war hir dermen, eo lakaat izili ar Strollad d'ober gant an an Newspeak a-benn 2050... Ar gerioù Newspeak — Ingsoc (English Socialism) ha Minitrue (Ministry of Truth, ministrerezh ar Wirionez) — zo bet awenet gant giz ar berradurioù en unvaniezh Sovietek, evel er gerioù politburo (Politburo of the Central Committee of the Communist Party of the Soviet Union), Comintern (Communist International), kolkhoz (collective farm), ha Komsomol (Kevre ar Gounourieon yaouank). E galleg : novlangue, hervez troidigezh Amélie Audiberti, un anv talvoudus da Françoise Morvan, pa lavar eo ar brezhoneg un novlangue. E portugaleg: daou c'her zo : novilíngua ha novafala. E spagnoleg : daou c'her zo : neolengua ha nuevahabla. Klemperer, Victor & Watt, Roderick H. LTI - Lingua Tertii Imperii: A Philologist's Notebook. Lewiston: E. Mellen Press, 1997. ISBN 0-7734-8681-X. An annotated edition of Victor Klemperer’s LTI, Notizbuch eines Philologen con notas en inglés y un comentario de Roderick H. Watt. Klemperer, Victor & Brady, Martin (tr.). The language of the Third Reich: LTI - Lingua Tertii Imperii: A Philologist's Notebook. London, UK; New Brunswick, NJ: Athlone Press, 2000. ISBN 0-485-11526-3 (alk. paper). Trad. de Martin Brady.